Morton Feldman(1926-1987) wrote his Instruments II the same year he founded June in Buffalo, a festival for emerging young composers at the music department of the State University of New York at Buffalo, where he taught. David Felder, who had been asked to join the music faculty at Feldman's invitation in 1985, took over the festival's artistic direction and has been in charge ever since. On June 5th, 2000, the 25th anniversary of the festival opened with a bang, which thanks to David Felder had been recorded afterwards (Slee Hall, Amherst NY, June 6-9 2000). The result is an artistically and technically outstanding CD, produced by Felder himself, who for this occasion had assembled the hand-picked June in Buffalo Festival Orchestra, consisting of 57 of the best instrumental specialists in contemporary music in the States and far beyond. From the original concert, only For Toru by Lukas Foss is missing sadly, but there was no more space. David Felder revised and realized his monumental one movement concerto for percussion and extended chamber orchestra, originally composed for a soloist with electronics(1991), between 1999 and 2000. There could not have been a more impressive and forward looking start to the anniversary celebrations than its world premiere with the impressive percussionist Daniel Druckman, to whom as well as to the memory of Morton Feldman it is dedicated. David Felder is known for writing extremely complex, but deeply surging and uplifting music and this work is no exception. This constant eruption of a volcano and all that, happens in between, possesses not only a mesmerizing beauty of colours and rhythms, it is also full of quiet as well as explosive danger. The level of energy captivates the listener right from the beginning and I am again fascinated by the way Felder manages - as he does in all his other works - to create a kind of tension one can not escape until the final bar. Despite the many pure technical thoughts with regards to the various musical materials and their interaction, this music expresses endless visions of angst, of vulnerability - and of hope. The work is of extreme virtuosity not only for the soloist, who next to a battery of instruments also plays a five-octave marimba and a KAT midi controller, but for all 57 musicians including three more percussion players; a virtuosity on a Lisztian scale (the New York composer Nils Vigeland in his short, but pregnant introduction). Coleccion Nocturna was composed 1982/1983; it also exists in a chamber version for the two soloists and four-channel tape available on Mode CD, 89 (S&H October 2000). The orchestra version, first played by the Buffalo Philharmonic Orchestra with the composer as conductor, the legendary Yvar Mikhashoff(piano) and William Powell (clarinets) in its 1985-6 season, is also vintage Felder. Based on a self-contained musical object from an earlier work, it contains five continuous variations for soloists, mid-sized orchestra and tape. It takes its inspiration from the poem Coleccion Nocturna by the Chilean poet Pablo Neruda, which Felder describes in his own words as powerfully evocative images of a surreal nocturnal landscape, great distance, both physical and spiritual, and a world rich in energy and exhausted isolation. Of course, Felder created his own searching musical poems full of intensity and atmospheric sensuousness, of danger and loneliness. Written fifteen years before In Between, it nevertheless creates the same tension and forces an unbiased ear to listen. In a musical world, which to the greater extend is occupied by experiments, minimalist deadening and public orientated vulgar emptiness, the music by David Felder opens a whole new world of deep rooted honesty and vision; a true composer of the 21st century. There is no other place but Buffalo, where the legacy of Morton Feldman is still vividly alive. The two works on this recording could not be more different. Instruments II mirrors Feldman's ideal of the flat surface, while The Viola in My Life IV is atypical and very unusual for a composer, who created a stagnant time sense. Here, the solo viola sings a deeply emotional song, a kind of love letter, while the sparing and transparent orchestra sound serves as a delicate and sometimes powerful background. The soloist Jesse Levine creates the most beautiful lyrical intimacy. This composition shows Morton Feldman as the true genius he has been. 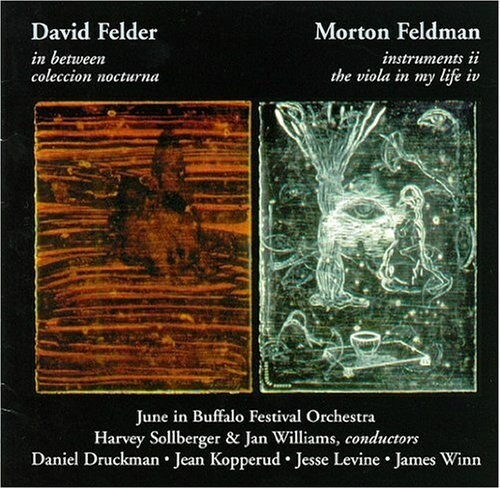 Morton Feldman and David Felder may musically be worlds apart, but they were close friends, accepted each other totally and created this magical island in Buffalo, where over the last 25 years contemporary music was able to blossom. This immaculate CD documents, therefore, not only two exceptional composers, but thanks to David Felder, also the unbroken spirit of June in Buffalo.